Structural characterization of the investigated peptides. 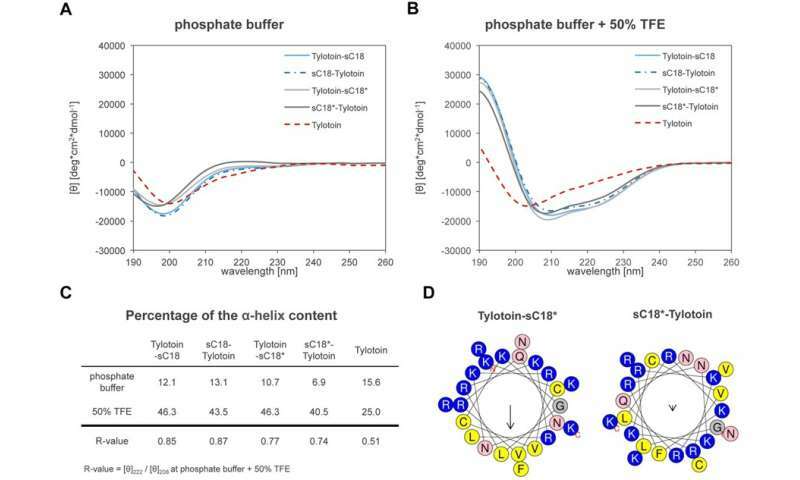 A) Circular dichroism (CD) spectra were acquired at a peptide concentration of 20 µm in 10 mM phosphate buffer, pH 7.0 B) spectra obtained in the additional presence of 50% TFE, C) the calculated percentage of α-helix content, D) Helical wheel projections of Tylotoin-sC18* and sC18*-Tylotoin as predicted by HeliQuest. Credit: Scientific Reports, doi:10.1038/s41598-018-34684-1. Cell-penetrating peptides (CPPs) have attracted great interest as delivery vehicles in medicine, with potential for the development of novel therapeutic agents or cosmetic products. Biological membranes are typically impermeable to almost all compounds with a molecular weight greater than 500 Da. In a recent study, Mareike Horn and Ines Neundorf covalently coupled a wound-healing promoting sequence (Tylotoin) with a cell-penetrating peptide to improve covalently coupled delivery of the drug across cell membranes. 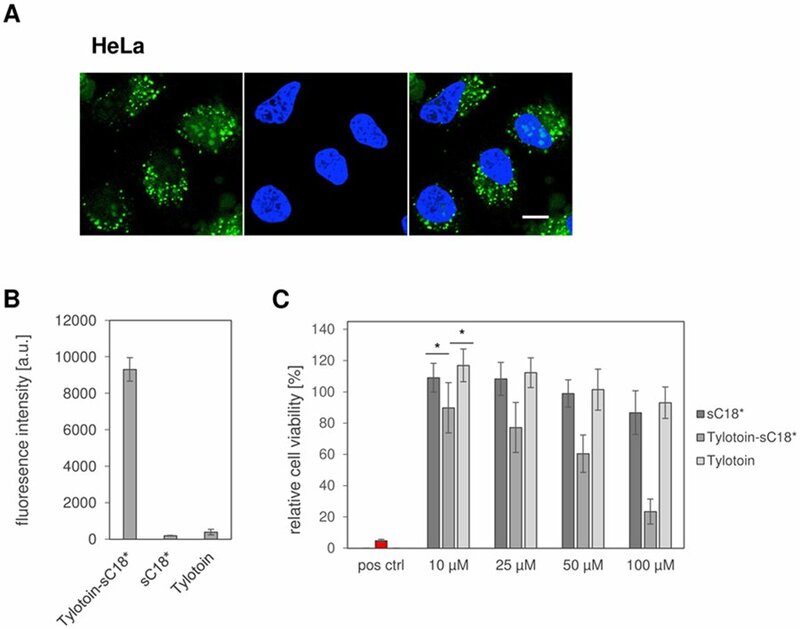 Cellular uptake of these novel peptide conjugates into keratinocytes was observed with internalization studies to show significantly improved delivery with good tolerability. The promising novel peptide chimera (Tylotoin-sC18*) was investigated in the study in a scratch wound closure assay to understand its wound healing capacity. The results indicated that the fusion of Tylotoin with a peptide did not cause a loss of its activity. In addition, its proliferative impact on keratinocytes was observed as an important step in the process of wound healing. Tylotoin-sC18* exhibited strong antimicrobial activities to prevent bacterial infection in the wound. As a result of their multiple functions, the authors assume the novel peptide chimera can be used to treat infected wounds as an agent in the future. The results are now published on Scientific Reports. Skin damage resulting from burns or disease require efficient wound treatment to advance public health and economy, forming a prevalent focus in healthcare. Delivery of therapeutic and active molecules through the skin is receiving considerable scientific attention, but cellular membrane impermeability of the skin is very challenging to overcome. As a result, cell penetrating peptides (CPPs), discovered in the past decade, have formed a promising approach to deliver large molecules across biological membranes. Relatively short in structure, CPPs are less than 40 amino acids in length with a highly positive net charge. The sequences are able to carry electrostatically or covalently bound biologically active cargoes across cell membranes, including plasmid DNA, siRNA and therapeutic proteins. In this context, the proposed mechanisms of cellular internalization include endocytotic processes and direct translocation via pores. The trigger to transport molecules and its exact mechanisms remains unknown. Tremendous efforts have been made in recent years on the use of CPPs as novel transdermal delivery systems to provide a safer alternative in the cosmetic industry. For example, in the treatment of inflammatory skin diseases, cyclosporine A was attached to polyarginine-7 to form R7-CsA. More recently, fusion proteins were designed with four structural classes of CPPs with the human epidermal growth factor (hEGF) as a wound healing agent. Peptide internalization into keratinocytes. A) Fluorescent images after 30 min of incubation with 10 µM CF-labeled peptides, green: carboxyfluorescein-labelled peptide; blue: Hoeschst 33342 nuclear blue stain. B) Corresponding flow cytometric uptake studies of the CF-labeled peptides in cells after 30 min incubation. Experiments were conducted in triplicate with n=3. Credit: Scientific Reports, doi:10.1038/s41598-018-34684-1. In the present study, Horn and Neundorf report on the fusion of a well-characterized cell-penetrating peptide called sC18 to a wound healing peptide sequence known as Tylotoin. The short peptide Tylotoin was recently identified and isolated from the skin of the salamander, Tylototriton verrucosus. The novel conjugates were evaluated for their cytotoxicity toward keratinocytes and in a cancer cell line in the study, to observe cellular internalization behavior and the impact of peptides on wound healing in vitro. The authors synthesized chimeric peptides containing Tylotoin and the CPP sC18 developed within the same research group. The study also included a truncated version of sC18 that lacked four amino acids from the C-terminal known as sC18*. The CPP was then fused C- or N-terminally to Tylotoin to result in four peptide chimeras that were synthesized via previously described methods. The secondary structure of the peptides was determined using circular dichroism (CD) spectroscopy. 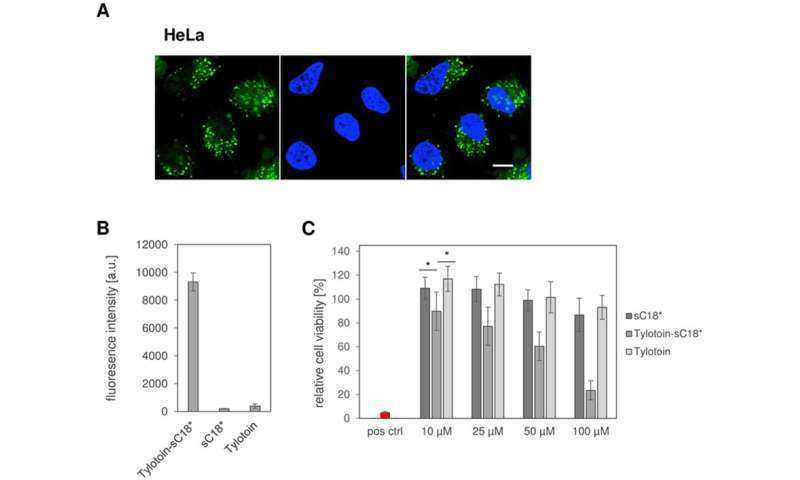 To eliminate cytotoxicity of the potential wound healing agents, the authors next investigated cell viability of the peptides on human immortalized keratinocytes (HaCaT). The results showed no cytotoxic effects on keratinocytes for Tylotoin-sC18, sC18* alone and with Tylotoin-sC18*. The internalization of peptides into keratinocytes was visualized using CF-labelled peptides. All peptides were internalized, and chimeric peptides notably demonstrated a strong distribution in the cytosol and nucleoli. 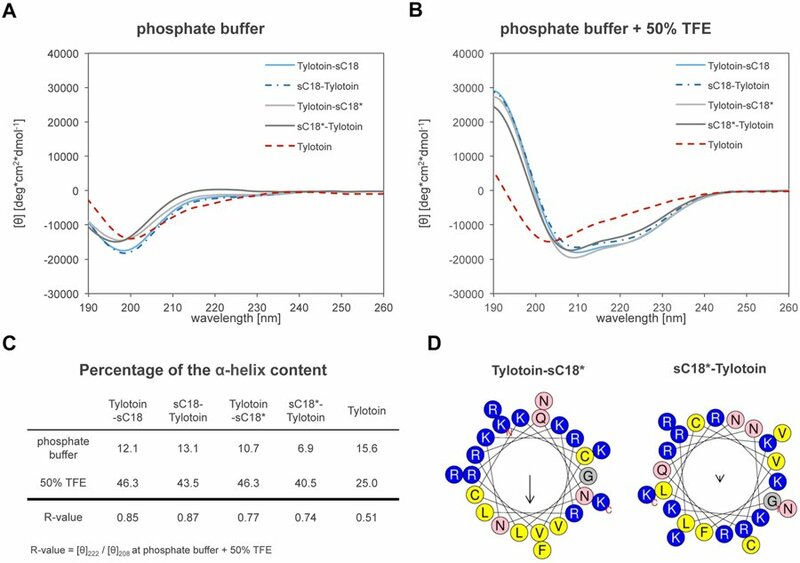 Interaction of Tylotoin-sC18* and its precursor peptide with model membranes. CF labeled peptides (20 µM) were incubated with A) neutral and B) negatively charged, giant unilamellar vesicles (GUVs) loaded with Oyster 405 (blue dye) for 90 min and analyzed by fluorescent microscopy. The vesicle membranes were labeled with 0.2 mol% of Atto550-DOPE (red dye). Credit: Scientific Reports, doi:10.1038/s41598-018-34684-1. In the next level of experiments, the authors investigated the initial step of cell entry on a molecular level using artificial membrane systems known as giant unilamellar vesicles (GUVs). The GUVs were composed of zwitterionic lipids to ensure better cell compatibility. 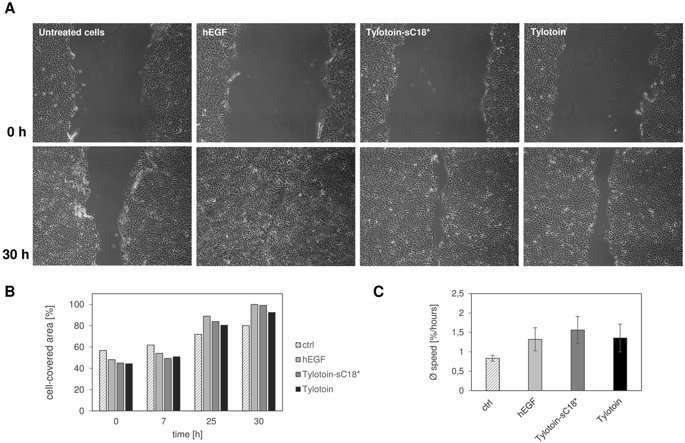 In the study, the authors used CF-labeled Tylotoin-sC18* alongside the fluorescently labelled CF-Tylotoin and CF-sC18* as controls for incubation at 90 minutes with neutral GUVs and anionic GUVs. The peptides did not significantly accumulate on membranes of neutral GUVs. In contrast, when anionic GUVs were incubated with the fluorescently labeled proteins, a strong peptide signal was detected, except for CF-Tylotoin. 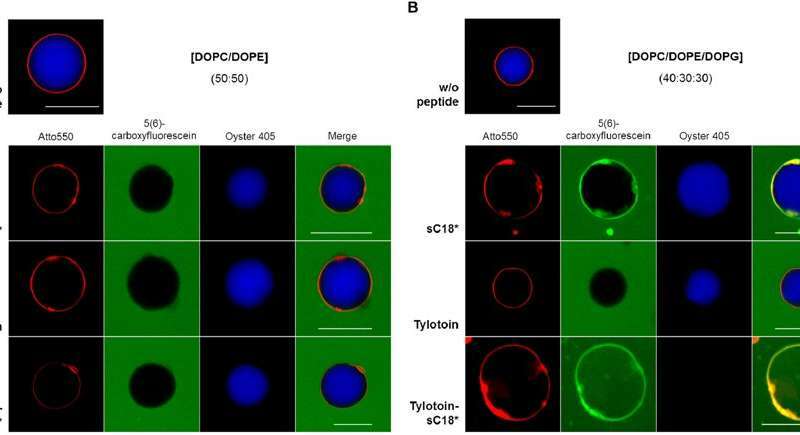 The interaction of Tylotoin-sC18* with the anionic lipid membrane resulted in significant dye release to completely stain the entire vesicle. To detect the effect of the chimeric Tylotoin-sC18* on wound healing, the authors used a scratch wound healing assay and observed keratinocyte migration. In the presence of Tylotoin-sC18*, the migration of keratinocytes into the wounded area distinctly increased 30 hours after scratching. Similar results were also observed with the human epidermal growth factor (hEGF). The novel chimeric peptide conjugate designed in the study had comparable migration efficacy to Tylotoin and hEGF. Evaluating the effect of the chimeric peptide on keratinocyte migration. The monolayer of cells was wounded by scratching the surface with a pipette tip and treated with 13.5 µM Tylotoin-sC18*, 13.5 µM Tylotoin and 100 ng/mL hEGF respectively. Cells without treatment were used as controls. A) wound closure monitored at 0, 7, 25 and 30 hours after peptide addition using inverted light microscopy. B) The percentage of cell-covered areas at each time point. C) The average speed of wound closure measured as percentage/hour, analyzed using Wimasis Image analysis. Credit: Scientific Reports, doi:10.1038/s41598-018-34684-1. The behavior of the novel peptide conjugate was also investigated in HeLa cells to understand its impact on a cancer cell line. The CF-labelled Tylotoin-sC18* HeLa cells were characterized by an extremely high uptake of the dye in comparison to the control peptides. The study also interestingly showed decreased viability in Tylotoin-sC18* induced cancer cells, significant even at lower concentrations hinting at potential anticancer activity of the peptide. The efficacy of Tylotoin-sC18* towards cancer cells. A) microscopic image of HeLa cells treated with CF-labelled Tylotoin-sC18* for 30 min at 370C. B) Quantified cellular uptake of 10 µM CF-labelled peptides for 30 min at 370C by flow cytometry. C) Cell viability of HeLa cells after 24-hour treatment with Tylotoin-sC18*, sC18* and Tylotoin. Cells treated with 70% ethanol served as a positive control. Credit: Scientific Reports doi: 10.1038/s41598-018-34684-1. The study also evaluated the inhibition of endocytosis and its effect on cellular uptake of Tylotoin-sC18* in to HaCaT cells. To establish conditions of endocytosis inhibition and constrain the energy-dependent pathway, HaCaT cells were incubated with Tylotoin-sC18* at 4 degrees C. The authors nevertheless observed the peptide's ability to enter the cells, with notable localization in the nucleoli, leading to the assumption that the peptide chimera can internalize via direct translocation. In addition, the fusion of the peptide sC18* to Tylotoin did not impair the inherent healing capacity of Tylotoin. As observed, the chimeric peptide increased healing capacity to promote in vitro wound closure by inducing migration and proliferation of keratinocytes. Coupled with antimicrobial properties, the novel cell-penetrating chimeric peptide Tylotoin-sC18* can be used as a novel topical agent for infected wound treatment.